This easy recipe is another one of my husband's favorites. I like it too, not only because it's tasty, but because it's so easy to make! It takes no time to peel the veggies and no time to cook. All you need is a few carrots and summer squash to make this beautiful vegetable side dish. I like to use one green and one yellow summer squash for the color contrast. You can sauté them in olive oil and butter, or steam them for an even healthier dish. 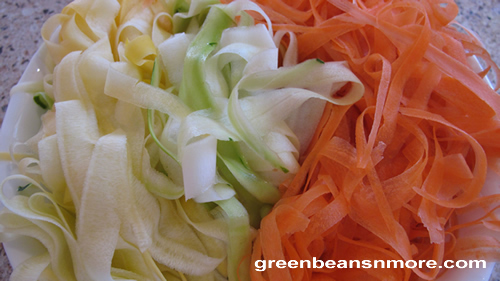 You can also use a variety of different seasonings to give these ribbon vegetables a different flavor every time you make them. They're a perfect side dish for fish brightened up with parsley and lemon. My favorite way to enjoy them is to season them with marjoram. Sometimes I add just a few mild banana pepper rings which gives them a totally different flavor. Using a vegetable peeler peel the carrots into long strips. Peel the outer skin off the zucchini and discard it. Peel the zucchini into long strips until you reach the seeds in the center. Discard the center. Heat olive oil and butter in large skillet over medium heat until melted. Add the carrots and zucchini. Using tongs, toss the ribbons to coat the in the oil/butter. Cook the vegetables, tossing often, 5 - 7 minutes, until wilted. Add your choice of seasoning(s) a few minutes before the end of cooking. Serves 2 - 4. Place the carrots into a steamer basket and steam two minutes. Add zucchini and steam 2 to 3 more minutes. Place vegetables into a bowl and toss with olive oil and your choice of seasonings. 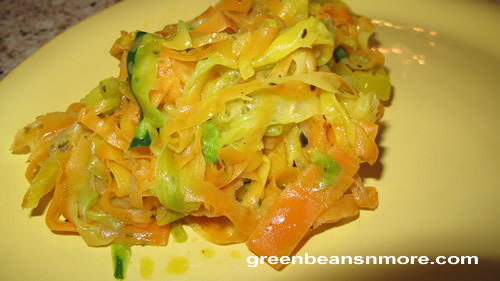 The above vegetable ribbons were sautéed in olive oil and butter and seasoned with marjoram and mild banana pepper rings.